Have you ever kept a writing tracking record? This simple document — you can create it easily in your own word processing software — will revolutionize your productivity…. When I wrote my first book, 8½ Steps to Writing Faster, Better, I made so many mistakes. Fixing all three of these problems partway through the process helped me to finish my book and reduced the amount of time I spent yanking out my own hair. But when I consider the challenge/benefit ratio (how hard did I have to work to change my behaviour and what benefit did I get from doing it? ), tracking my output was an extraordinarily beneficial change with almost no pain. You have to love that. Here’s how tracking your output — specifically, recording how many words you write each day or how much time you spend editing — can help you. It will reduce your stress. You’ll always know exactly where you are in your writing project and you can both celebrate your achievements or, if things are going awry, change your game-plan quickly. It will improve your motivation. It’s tempting to have a vague idea that you “want to write a book” or “finish the annual report one week before deadline.” But if you don’t have a plan, you’ll never be able to accomplish either of those tasks. Seeing what you’ve done every day, however, will help make the project more “real” to you. And when your tracking chart shows lots of activity, that record will give you a big shot in the arm. And when it shows inadequate activity, this finding will help motivate you to make some changes. It’s just like wearing a pedometer (which I also do) — the act of tracking causes you to do more. It will alert you to problems ahead of time. If you miss a day of writing because your car broke down or the babysitter was sick, that’s understandable. But if you miss five days of writing, you have a bigger problem. 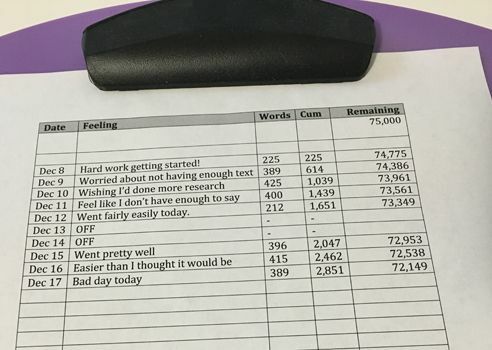 Tracking your word count will force you to be honest with yourself, acknowledge your shortcomings and, most of all, make a plan for doing better the next day. It will keep you focused. If you’ve developed the habit of working only in “spurts” or binges you likely take off many days, or even weeks, between writing sessions. As a result, you’ll forget at least some of your research or your plans, and you have to spend a good chunk of time catching up every time you resume work on your project. With tracking, however, you’re more likely to feel comfortable writing for small amounts every day. Bonus: you’ll remember what you’re working on and won’t have to spend any time getting reacquainted with the project. It will help you recognize that your feelings about writing are irrelevant. One of the key findings from my tracking chart was that how I felt about my writing (that it was great and I was the next Susan Orlean or that it was an abysmal failure and I should reconsider my career) bore no relationship to how many words I could produce each day. I could write 500 words on days when I felt terrible and, conversely, squeeze out only 350 on days when I felt terrific. In other words, writing is just a job, and my self-worth bears no relationship to it. This discovery is freeing. I’m sure there is software that could handle the tracking job, but let’s keep this blissfully simple and affordable. OK, you are now the proud owner of a tracking record. Fill it in every day, tracking the date (column 1) how many words you wrote (column 3) and your feeling about that writing (column 2.) When you’ve finished that, calculate the cumulative number of words you’ve written to date (just add today’s total to the cumulative number in yesterday’s column 4). And, finally, wrap up your tracking by subtracting the new cumulative total from the number at the top of column five. Then you know exactly how much more work you have left to complete. Here’s what I discovered: Once I’d hit the halfway point, the writing became markedly easier and faster with words accumulating like snow on a fence during a storm. I know this is illogical and unscientific, but that’s the way it worked for me. Try tracking and tell me if it does the same for you. My 4-minute video last week aimed to help fiction writers improve their focus. See it (or read the transcript) here and consider subscribing to my YouTube channel. If you have a question about writing you’d like me to address, be sure to send it to me by email, Twitter or Skype and I’ll try to answer it in the podcast. Do you track your writing? Why or why not? We can all learn from each other so, please, share your thoughts with my readers and me in the “comments” section below. Anyone who comments on today’s post (or any others) by Nov. 30/17, will be put in a draw for a copy of Metaphorically Selling by Anne Miller. Please, scroll down to the comments, directly underneath the “related posts” links, below. Note that you don’t have to join the commenting software to post. See here to learn how to post as a guest.